Seashells, starfish and loving words form the background for this beautiful beach wedding invitation. Your wording appears within a slim frame printed in your choice of colors and lettering styles. Invitation includes inner and outer envelopes. This product features thermography printing. Thermography is a unique printing technique that results in raised lettering you can feel, which adds to the luxurious experience of this printed piece. We were shorted 4 colored envelopes that we paid extra for. The writing on the pre printed part of the invitations (not our wording) was lighter than it looks online and some of the words, the writing is extremely light and there was no glue on the envelopes so we had to tape them closed instead of sealing them with a liquid stamp or licking them. Since we are having a small, destination wedding and trying to cut costs, we did not want to spend $300-$400 on traditional invitations. In looking at your site, we thought this would be perfect. I will not recommend your services in the future. This is a definite example of "you get what you pay for"
Overall im satisfiesld with the invitations. The paper was pretty flimsy, I thought it could have been a little more sturdy. What I thought were 2 printed inserts, were actually cards and had to be cut to fit into the outside pocket. Ink was pretty and exactly what I ordered. ordering our invitations was fast and easy. Love them! Overall, the invitations looked lovely. I fell in love with them. Order the sample! You really get a feel of what you will be receiving. One thing I didn't like was that a lot of the invitations had glitter in blobs. It was definitely noticeable. Huge shiny globs on an invitation don't go unnoticed. I'd order extra just in case you have this problem with some of yours also, or order in advance and make the company reprint the ones that were messed up. I didn't have time to do this so some of my guests got the ugly invites. So great for the price! Loved these invites and couldn't be happier for the price. Did not want to deal with the stress of printing my own invites and I couldn't find a better price anywhere else. The delivery was super fast and love the online chat for any questions I had. Ok, but not worth the cost. 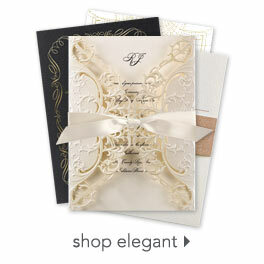 Product was an ok wedding invitation but for the cost I wish It was more extravagant. We actually added our own unique touch to the invitation but adding ribbons (our wedding colors) to the invitation. We really wanted something with ribbons but still having a beach theme but the website didn't offer any. So we added to this invitation. The writing was much smaller than I inticipated. Would recommend getting a copy before ordering. Not sure if it was because of the wording or the lettering I picked. Everything was great except the reception cards and rsvp cards. It looks as if when they were printed some part was hanging off. This caused a bend in the top portion of the fold so none my cards laid flat when folded but stuck up in the air. The cards in the same box that did not have printing on them did not do this, so I assume this is from a printing process. That was a little disappointing after the price we paid. The invitations and envelopes are both very nice. The only complaint I would have would be I had to pay another 35$ once they were delivered to the shipping company and because I wasn't home the first day the delivered them I didn't receive them for about a week. Nothing really to do with the ording website just beware when shipping! Excellent service, fast shipping , cute beach theme for my beach wedding! Website was easy to use & fun! Definitely would buy this product again! This product is for my daughter's wedding! Love the look and colors! My invitations were exactly what I wanted and what I ordered. I looked around at several different options and waited for this company to put what I wanted on sale. When they did I was ready and saved alot of money along with no shipping charges so I beat out all other prices by over $100.00 When my order finally arrived I was thrilled with everything except the little white treasure chest ring box. The lid would not close but I am crafty and fixed it. Nice product and prompt, good delivery.